After sitting at a desk for years, I thought I already knew what I needed while shopping for an adjustable standing desk. It turns out I had a lot to learn. For one thing, it is not just about the look of the desk itself. Sure, I need to like its curves and lines. But I had to see if the one I liked measured up in all the right places. If you are considering an adjustable sit and stand desk, you’ll certainly make sure the space it needs to occupy is available where you want it to be placed in the office. But if you are considering a model that rests atop a regular sitting desk, be sure there is enough room for cables to move up and down behind it. You will also need a little space around it to move up and down freely without knocking things over or blocking its fully collapsed position. These are not the only measurements you need to make, however. Does it measure up in all the crucial places? If your ergonomics consultant didn’t tell you, sitting at a desk requires individual sizing and placement of all the pieces. Getting a standing desk requires the same attention to detail. Not all standing desks are created equal—at least not to the heights you need. While there are adjustable desks, even ones that you can move up and down within seconds, they vary in heights of adjustment. You need to determine what height will be right for you to work in both the standing and sitting positions. This matters not only for the height of the keyboard and mouse, but also the position and tilt of the monitors. 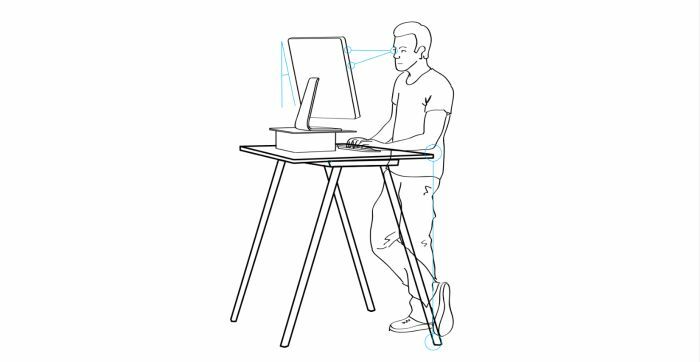 You’ll note in the diagram that both the standing and sitting heights allow the forearms to be parallel to the floor while typing and using the mouse. The monitor is also placed in the optimum ergonomic position whether sitting or standing—the top of the monitor is near eye-level. These positions vary from one person to another, so the desk must be adjustable with the keyboard tray placed lower than the surface upon which the monitor rests. Many adjustable standing desk designs therefore place the keyboard tray in a lower position relative to the desk’s main surface. Keyboard tray placement is one of the most important standing desk height measurements that you need to check. Many of the adjustable standing desks I looked into did not place the keyboard high enough. This would result in extension of my wrists, bending them backward when typing as opposed to the natural, straight position. Those desks would have led to wrist pain and potential permanent physical damage. To determine the final keyboard tray height, check the dimensions supplied by the manufacturer for the desk in the fully raised position. Stand-alone standing desks will include that height in their diagrams, but if you are considering adjustable desks that rest atop an existing sitting desk, add the height of the tray to the height of the desk you will be placing it on. Does the chair matter for a standing desk? Many people want to get a sit and stand desk so they can switch between standing and sitting whenever they feel the need. If you are planning on one of the models that sit atop an existing desk and can be lifted up to the standing position (most do this easily with little effort required), measure for the desk’s lowest position first. This is because it will almost certainly place the keyboard and mouse at least an inch or so higher than the existing desktop. Your forearm position at the keyboard when sitting will be the height of the main desk itself plus the height of the keyboard tray on the standing desk in its fully collapsed position. You can determine the height that the new standing desk will add to the lowest position by checking the manufacturer’s specifications. Adding these two measurements will determine how high the keyboard tray will be from the floor. Once you know the height of the keyboard and mouse on the new standing desk in sitting position, measure to see if your forearms will be parallel to the floor when typing—the ergonomically correct position. Once you have the chair height right, will your feet be flat on the floor? If your current chair will not adjust high or low enough for your forearms to be parallel to the floor while working at the keyboard, you will need a chair that can get you to the proper height. I had to order a drafting chair with a foot rest to get the height adjustment I needed and a proper place to rest my feet when sitting. How do your feet feel about the desk? It turns out, many people don’t initially get one of the most important standing desk accompaniments until after attempting to stand at the desk over a period time, only to return to their seat—at least for a little while. The most people cannot stand for extended periods due to leg and foot fatigue pain. My coworkers whom I have discussed this with informed me that is why they sit back down after a short time. This highlights the one component of a proper stand up desk configuration that seems most often minimized or forgotten: the anti-fatigue mat. When first shopping for an adjustable sit and stand desk, I realized this issue of foot and leg fatigue might become an issue right away. So the hunt for a good anti-fatigue standing mat became a big part of my research. There are many anti-fatigue mat options—more so than the standing desks themselves, it seems. Reviews and comments from myriad users highlighted the fact that cheap versions such as regular foam rubber or thin, flat mats were not going to cut it if I was going to be serious about standing at my desk for much more than an hour or so at a time. Some of my colleagues did not obtain a decent mat at the outset and as a result, do not stand very long. Fortunately for me, the standing desk mat I chose has allowed me to stand comfortably all day with occasional sitting. My legs and feet do not get overly fatigued since I am able to shift about and flex my legs throughout the day without distraction. What is more, I made sure that my mat choice allowed me to move it out of the way without bending over to lift it when it is time for the chair—which would be counterproductive for my back. As a result of all my measurement checks, research, and careful shopping, my back, arms, wrists, and neck feel much better now. I am also more energetic and focused. With attention to these three crucial issues when shopping for a sitting and standing adjustable desk, you can find the solution that fits you perfectly. After sitting at a desk for years, I thought I already knew what I needed while shopping for an adjustable standing desk. It turns out I had a lot to learn.